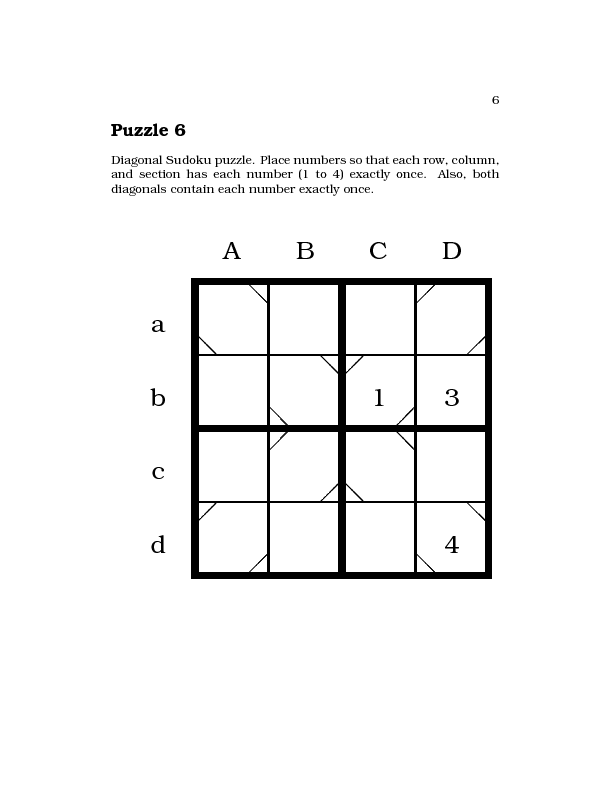 This page contains resources for sudoku-like puzzle designers. 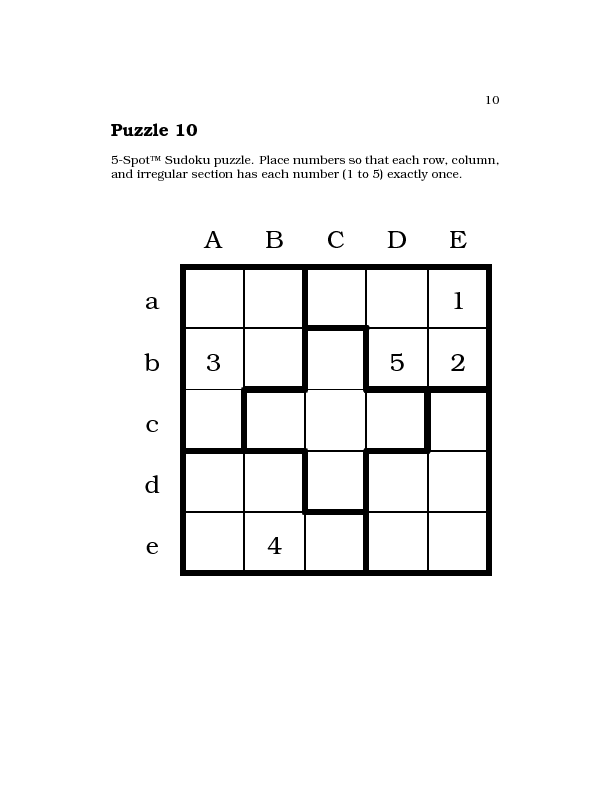 We provide samples of various sudoku-like puzzles. The designer is welcome to select one or more of these designs and build her/his puzzles. We will be grateful for the acknowledgment of the source. If you send us your own design (showing that the puzzle is feasible - we do know that some diagrams are not feasible), we will post it and acknowledge it. We will provide links to other resources of interest to designers and serious sudoku solvers. 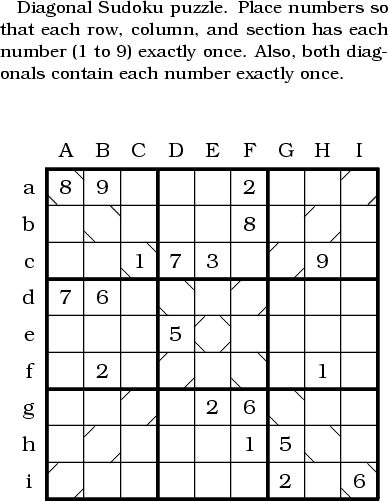 Here is the grid for standard sudoku. Invented by the original designers of "Number Place Puzzle". 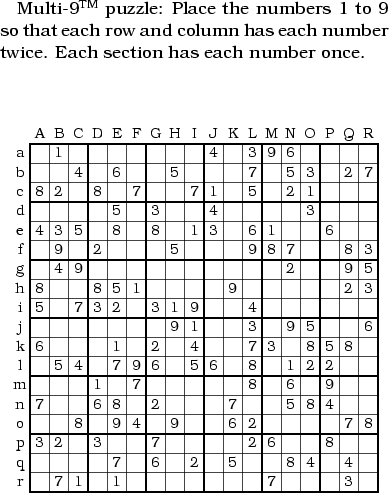 Here is the grid for four-by-four sudoku. Good for introducing kids to sudoku and sudoku-like puzzles. 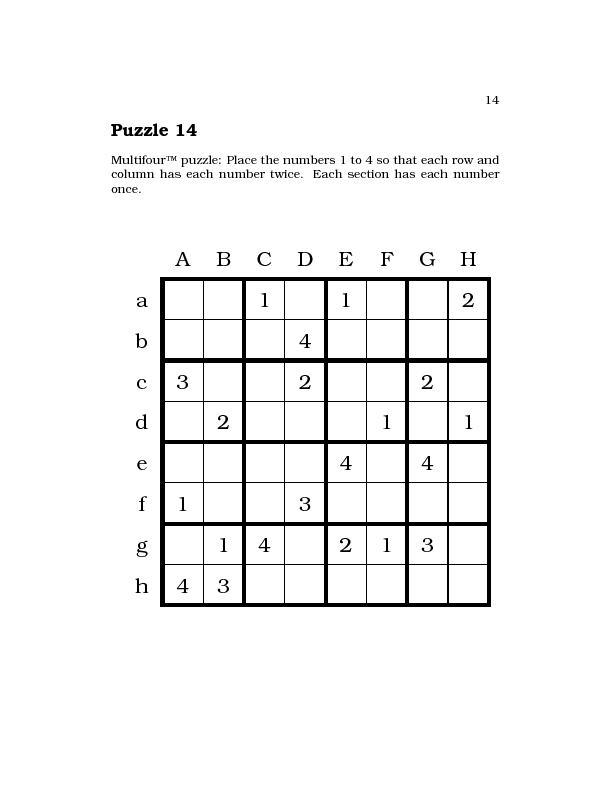 Here is the grid for 16-sudoku. Probably invented by the designers of the original sudoku. We have samples of 25 and 36 sudokus, and those were requested by various correspondents, but we never heard about anyone actually solving any of those. Here is the grid for diagonal-sudoku puzzle. Probably invented by the designers of the original sudoku. Some people call it kokonitsu. 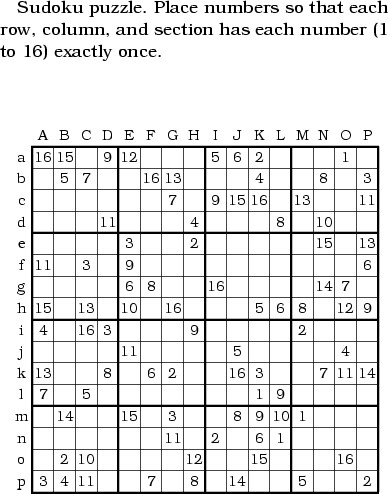 There is even a diagonal 4x4 sudoku (for kids). Invented by Raphael Finkel. 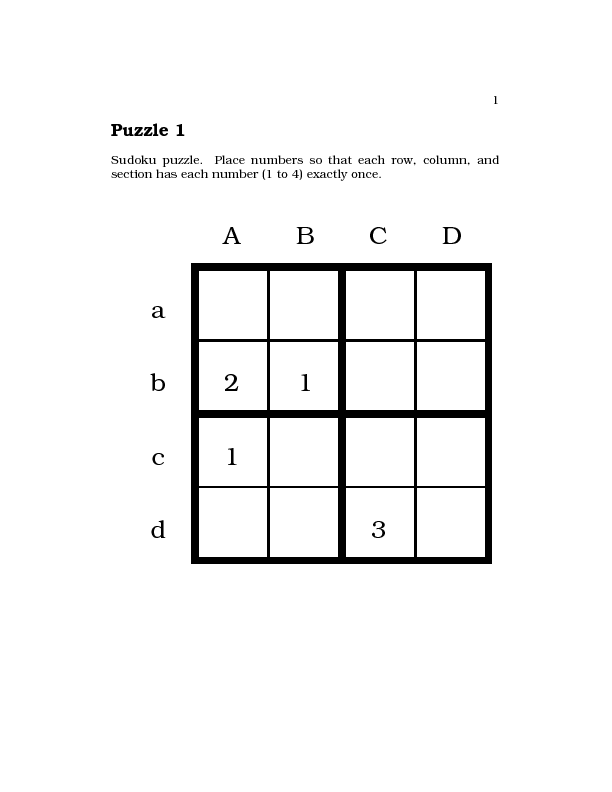 Here is the grid for Five-spot sudoku-like puzzle. Invented by Raphael Finkel. 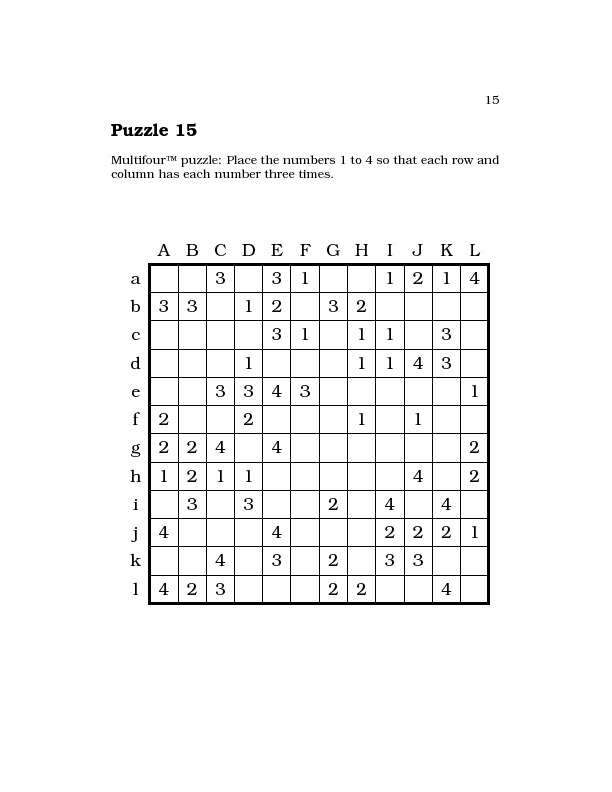 This and the next one are great for kids who find 4x4 sudoku too easy. 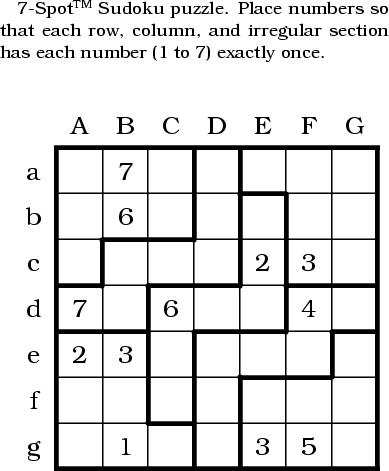 Some people call these (and similar, see below) grids "jigsaw" sudoku. Here is the grid for Six-spot sudoku-like puzzle. Invented by Raphael Finkel. Here is the grid for Seven-spot sudoku-like puzzle. Invented by Raphael Finkel. Here is the grid for Eight-spot sudoku-like puzzle. Invented by Raphael Finkel. 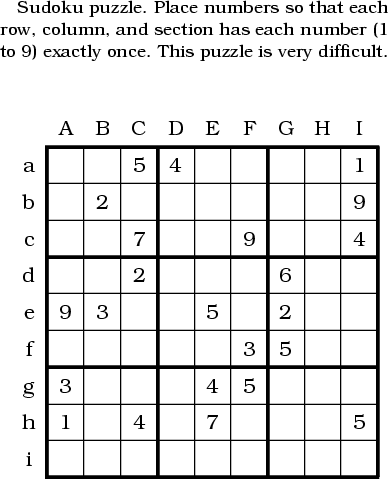 Here is the grid for Nine-spot sudoku-like puzzle. Invented by Raphael Finkel. This is a grid alternative to the classical 9x9 grid with square sections. This grid offers an opportunity for truly subtle puzzles. Here is the grid for 12 by 12 puzzle based on so-called combinatorial designs. Invented by Mirek Truszczynski. 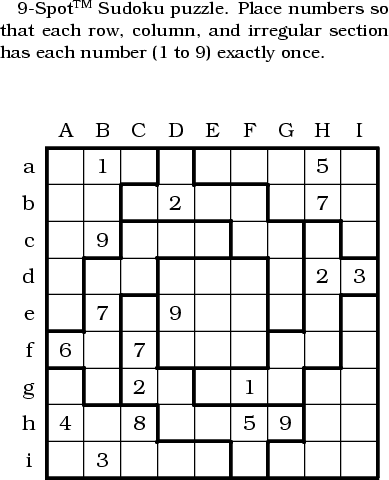 Here is the grid for 18 by 18, double sudoku-like puzzle. Invented by Raphael Finkel. Simplified version of the previous problem. 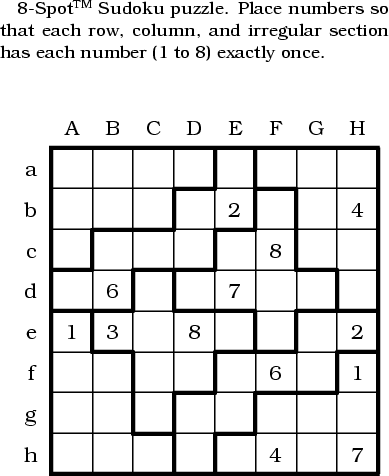 Here is the grid for the "doubled" version but not of the classical sudoku, but the 4x4 sudoku ("kid-version") Invented by Raphael Finkel. 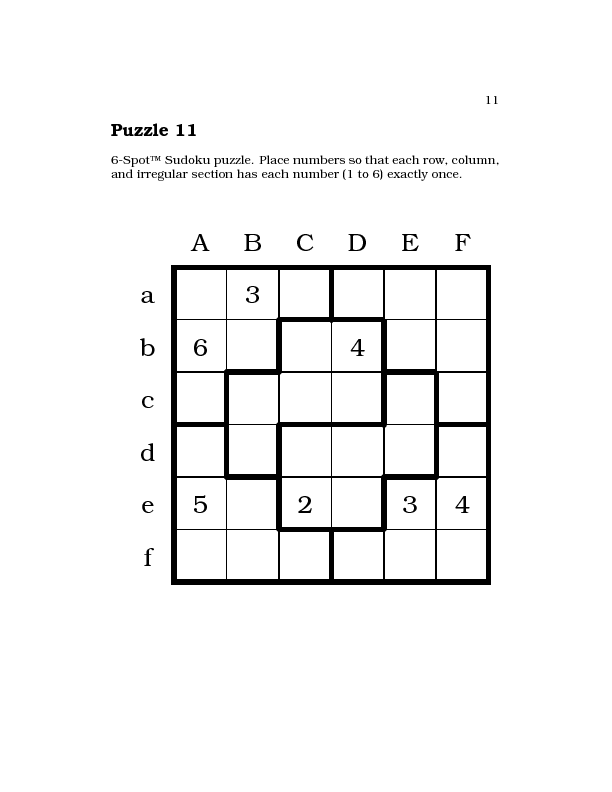 A paper entitled "So you want to generate your own sudoku?" where we describe what does it take to write a decent software generating sudoku and similar puzzles. Requires some knowledge of SAT or like solvers, but hints at many other possible puzzles that may be done with the same software. This includes all the above grids (no source code provided, just the technology discussed there). We wrote this paper last summer, and it still can be greatly improved. We publish it in expectetion that SAT/ASP people should be able to use their technology for fun, not only for profit.